In the mid 1960’s, when I was a small boy, my father took me through the back door of 80 King Street West in Toronto. The noise was unbelievable – as was the gargantuan monsters inside. This was the Toronto Daily Star, and I had witnessed the presses printing the evening edition live! Men everywhere - some just standing - others climbing all over the “monster” presses. But, it was the noise that I remember most - machinery and webs of paper whirling, spinning and racing through the machine units. Finally, ending at the folder in sections only to be carried off again by claws on and endless snake-like chain. I was captivated. This is where I fell in love with Print! 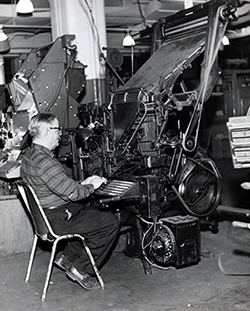 By 1971, the Toronto Star would purchase one of five new Hoe-Crabtree Viceroy Mark II double width presses that could print a 144-page paper at speeds of 70,000 copies-per-hour. All by letterpress and in their new home at One Yonge Street. But what I didn’t realize or even understand, as I stood there wide-eyed, was that there was a strike raging with all three of Toronto’s dailies. Not only was The Toronto Star involved, but so was The Globe & Mail and Toronto Telegram. “The Telly”, as it was called, was run by John Bassett. Bassett, along with other Toronto media moguls, also owned Baton Broadcasting. The Toronto Typographical Union (TTU) found itself in labour negotiations with all three publishers in 1963. Known as TTU #91, the union had until that time enjoyed relative harmony with the publishers. The oldest Union in Canada, the TTU had taken a stand back in 1872 when they struck George Brown’s Globe demanding a 9-hour day. Some suggest it was this catalyst that gave us Labour Day in September. Besides the dramatic strike of 1872, the TTU had co-existed peacefully with its employers and even in 1907, won the first 8-hour day when all other industries were struggling through 9- and 10-hour days. The TTU was not a unilateral organization. In 1866, they joined the American National Typographic Union – latterly called the International Typographical Union or ITU. Even so, things in Canada amongst all the printing trades unions were rather bucolic. 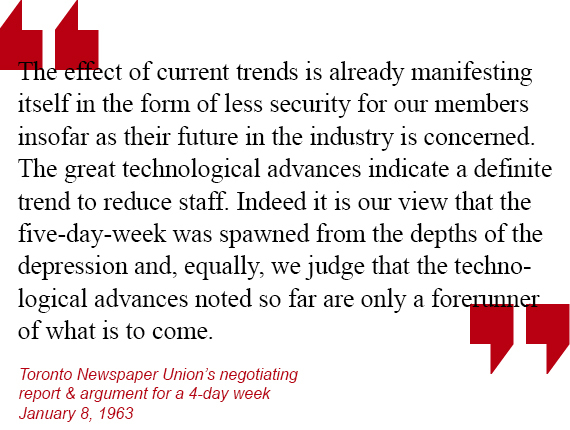 In 1964, technology was at the root of the strike. For decades, very little in the way of new processes entered printing plants. In Sally F. Zerkers splendid book The Rise and Fall of The Toronto Typographical Union 1832-1972, she writes that in 1896, it took an average of 635 man-hours to produce 10,000 copies of a four-page newspaper section. Thanks to Mergenthaler’s Linotype and new stereotyping technologies - by 1926, the same four pages could be produced in just 17.4 man-hours. A productivity increase of 264%. Working without a new contract, as the old had expired at the end of 1962, the TTU set about to get another two-year agreement with various demands. A four-day week was included along with the nominal pay rises and shift premiums. But, one issue was relatively new. That was technology and its impact on job security. In 1963, there were just over 1,000 members in the TTU. The roles had dwindled for decades prior. The other printing Unions - Pressman’s, Stereotypers & Electrotypers, Photo-Engravers, Mailers and Bookbinders - had contracts that were not in in the same cross hairs. Other than a pat on the back, none of these unions did anything to help fight for the TTU. Various new technologies had come on the scene, and almost all focussed on one area: type matter preparation. Harris Intertype and Mergenthaler Linotype along with Fairchild had developed faster tape-driven machinery driven by newfangled computers. These devices could spit out miles and miles of perforated paper tape. To make matters even more dire, the copy was already justified and the tape could be fed into new linecasting machines thereby eliminating the operator. 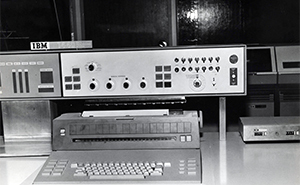 Faster and cheaper got even better when the wire services such as Canadian Press and Reuters could supply their news stories on tape and feed directly into the new machines. Publishers loved it all and wanted more. New devices using film fonts were also entering the publishing world and who knows where that would lead? The TTU was really concerned. Recent New York negotiations with its unions had produced some reasons for optimism as contracts stipulated that no man would lose his job (yes, they were all men! ), if and when new processes replaced old. But, the publishers held the upper hand. Now perforated tape could be composed by women. They were well suited and faster typists – cheaper too! The strike began on July 9, 1964, after months of haggling back and forth. True, the TTU may have settled earlier, but each time a draft was sent to the Colorado Springs ITU Headquarters, it came back altered. This angered the publishers greatly. No manner of growls and hissing from the workforce could change the publishers' minds, as they had the upper hand and knew it. So, the TTU was locked out. The publishers called it a strike, while the union said it was a lock-out. Threats from both sides ensued. The union screamed about publishers hiring scabs and union busters from the U.S., while the publishers complained of harassment and vandalism to their equipment. The newspapers continued to get their papers out and with these new technologies even faster than before. There was an impasse and it was never settled. The TTU basically picketed year after year earning strike pay until notified by the ITU in 1971 that all benefits would cease. The TTU was broken after 139 years. Oddly enough, the Toronto Telegram facing losses, closed its doors in 1971, and sold its mailing list to the Toronto Star. The Tely also rented out their Goss presses to the Toronto Star as the Star was in the midst of moving to One Yonge Street. John Bassett had been singled out as the whipping boy by the TTU. 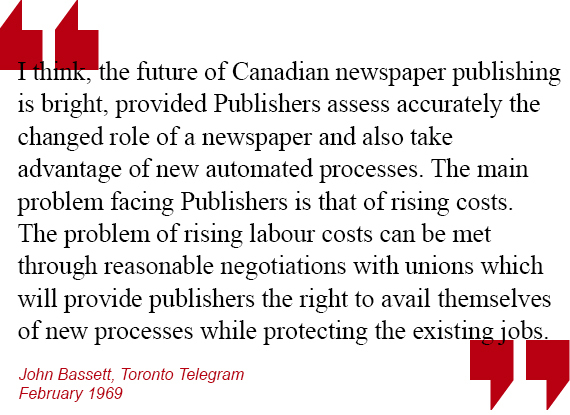 Bassett’s loses may have had nothing to do with the strike and more to do with the competitive nature of the newspaper industry in Toronto. The Tely vacated its building at 440 Front Street West only to see the Globe & Mail move right in with presses and hot metal typesetting in tow. The Globe also brought their ornate front entrance too! The TTU was a fixture in Toronto media and book publishing but, looking back through history, we can study just how new technologies give birth to new opportunities and profits. In 1964, there was absolutely no way a union could stop technology. Fast forward to 2017 – the story is exactly the same. Owners of print media businesses will never stand still when around the corner a technology will do away with costs. Labour is a major element to overhead. We may all decry companies such as Amazon and Walmart for driving down prices on everything from groceries to books, but most of us shop there anyway. The photocopier business used to call their equipment “green button printing”. Today’s printers are no different than Bassett and his cohorts. They will always embrace technological improvements. The blossoming digital equipment world is set to explode even further and faster, and we can see this with the rapid decline in offset machinery in the commercial segment. There is but one lesson from the past: learn from it and don’t repeat it.